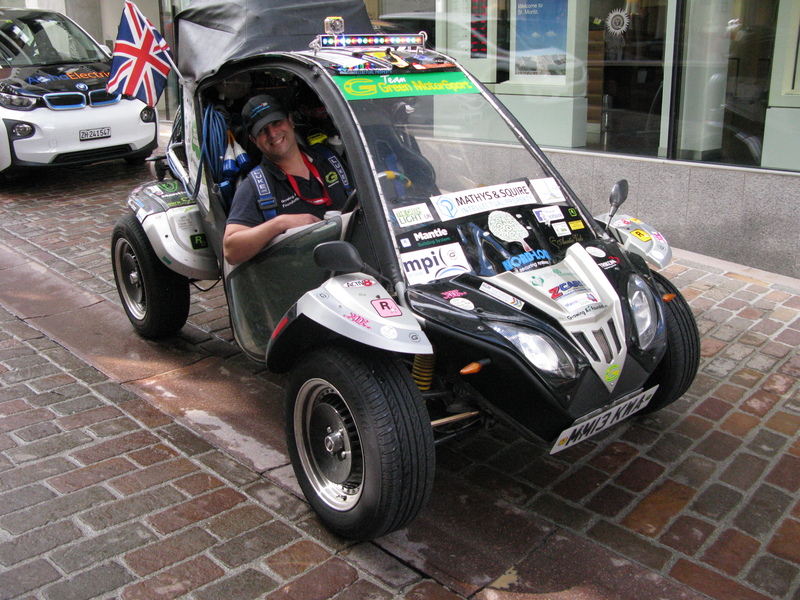 Team Green MotorSport has returned after participating in the 5th World Advanced Vehicle Expedition (WAVE). 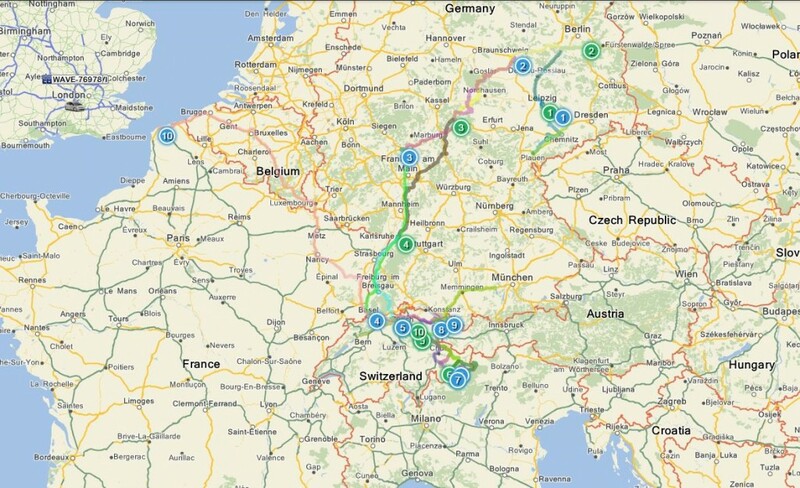 Starting in Plauen near Berlin, 90 teams from all over the world drove across Europe powered by energy sourced from the sun or wind. They visited over 20 towns en route, giving presentations to local communities, businesses and schools. 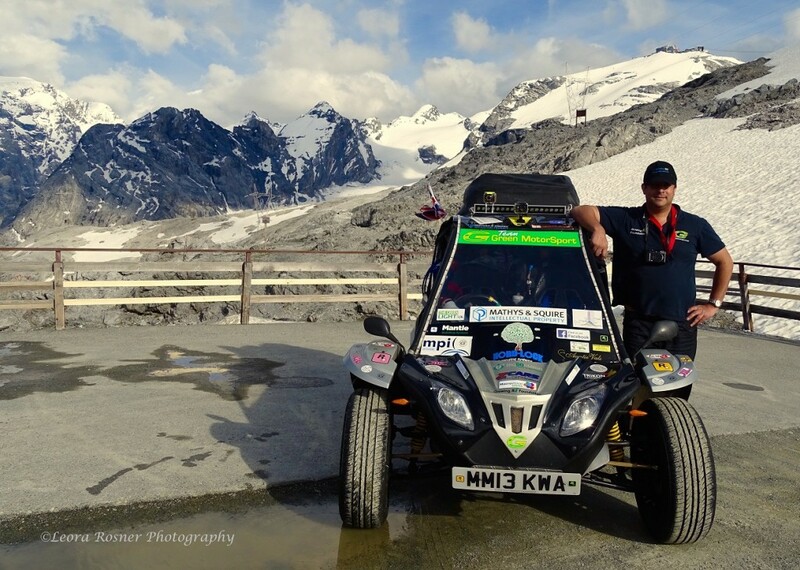 The Green MotorSport buggy called the Tapir, is seen here at the highest point in Europe at 2750 meters in the Italian Alps. Gordon Foat of Green MotorSport Limited was accompanied in Vehicle 1 on WAVE by Leora Rosner of the Growing Air Foundation. Growing Air Foundation (GAF) is a non-profit organization raising funds to replant forests that have been destroyed or degraded. Our 2nd Team (11) was the electric 356er Speedster provided by Turn-e and was piloted by Keith Ashford who has joined Green MotorSport as a drive train development engineer. Guy Weemaes who shared the driving works as a professional automotive blogger with GoingElectric.de and is based in Germany. Both were awarded the Blogger prize and 1st prize for Best Design. 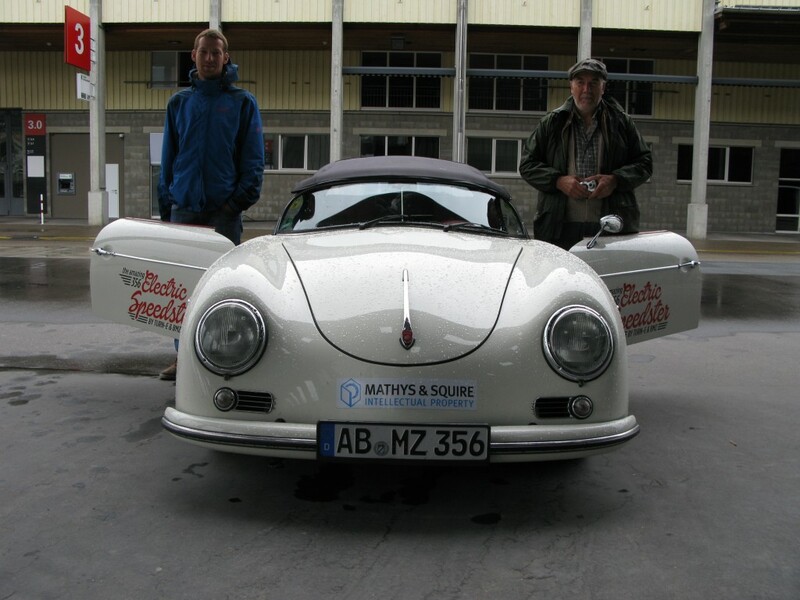 Green MotorSport is proud to announce that Mathys & Squire has assisted with the complexities and used their expertise to protect our future products and brand. We would like to thank them for all their support towards bringing our products to market and for assisting with our teams on WAVE 2015. We would also like to thank all our sponsors. The Green MotorSport cost effective electric drive train system that was installed in the Tapir with our lithium battery system performed extremely well throughout the journey. The WAVE rally includes some of the toughest climbs in the world. Road and weather conditions can be perilous but this is perfect for pushing the boundaries of innovation, research and development. WAVE 2015 also celebrated the longest drive on one charge by a battery electric vehicle during the KINGS RALLY stage set by our friends of the Institute Metron, with Metro Team 7 having driven 826 km on a single charge from Berlin to Karlsruhe! Although the motors used in the prototype were producing maximum continuous power while climbing the mountains, due to the motors efficient liquid cooling design they were actually performing greater than expected with over 15.5 kW continuous power output on some of the most prolonged aggressive mountain climbs in the Swiss Alps. On the way down on the other side of the mountain, the batteries were recharged by regenerative braking. Regen braking comes standard with all Green MotorSport cost effective motor packages. In these demanding conditions, we were able to significantly increase our range using the energy gathered from the descent, harvesting the power generated from the motor using the dynamic regen system. The objective of Green MotorSport is to provide drive trains for purpose built electric vehicles which people can afford to buy. They will initially be used for local deliveries, commuting or essential personal mobility. Currently our utility buggy prototype provides a demonstration of the robustness and efficiency of our mass production electric motor systems. The cost effective system gives over 100 miles range on one 4 hour charge and this will increase as we make advances with the technology. 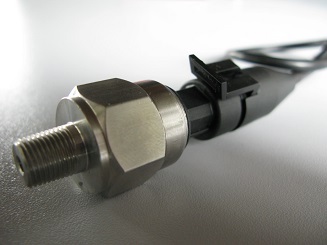 The Tapir is testing some very innovative bolt securing technology provided by Nordlock Bolt securing systems. Our motor drive is probably the most important mechanical component on the vehicle supplying drive in forward and reverse to the main differential. It’s the innovative securing feature of the Nordlock that keeps these parts together under extreme environmental conditions. The Tapir has a differential gearbox which was treated with a special lubricant provided by one of our technical sponsors. The aim of the project was to increase the performance and reliability of the gears and to reduce rolling road resistances. ACTIV8 Universal Friction Reducer is an oil additive for engines and transmissions that reduces metal to metal wear by up to 90% The additive was also injected into the front wheel bearings to increase the range of the car. The Tapir was installed with a state of the art tracking telematic monitoring system for WAVE. The system is called routeMASTER. The routeMASTER system is sponsored and supplied by AGM Telematics. The routeMASTER vehicle tracking system is a complete vehicle and driver tracking system. One can track the entire fleet in real time, monitor progress of any job and deliveries. Above is the combined map of our WAVE Rally route for both Team 1 and 11 cars generated using the AGM Telematic routeMASTER system. The system provides a record of each vehicle’s movements on a minute by minute basis throughout the day. Easy to use software provides live journey start/stop times and reports plus minute by minute journey details. The system also records how the vehicle is being driven; any heavy acceleration, braking and cornering is reported allowing for fleet and driver comparisons. Driver feedback and coaching reports are generated to show where efficiency improvements can be made. 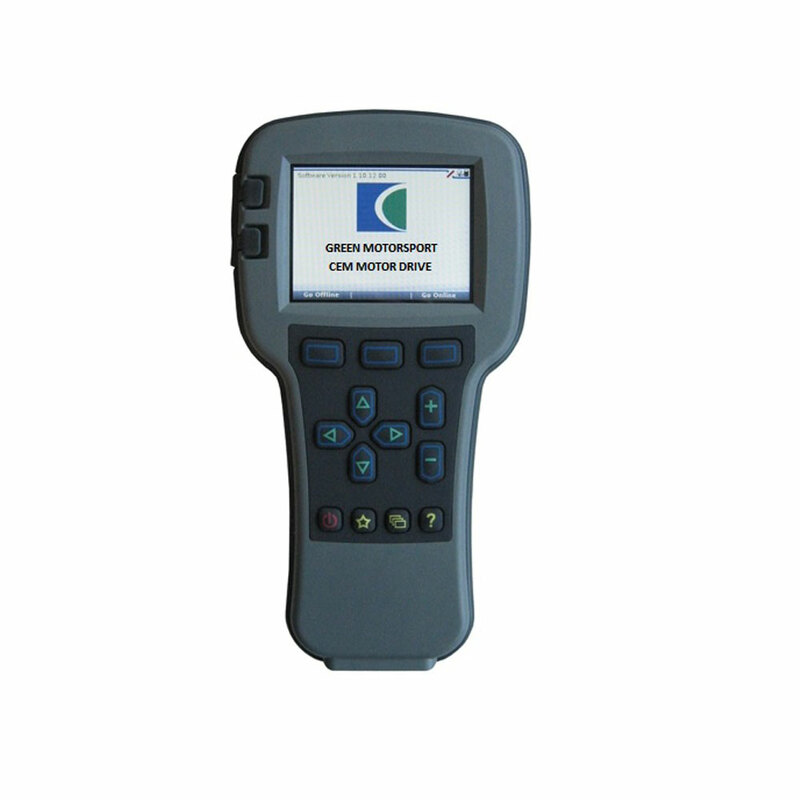 Battery voltage can also be monitored real time. 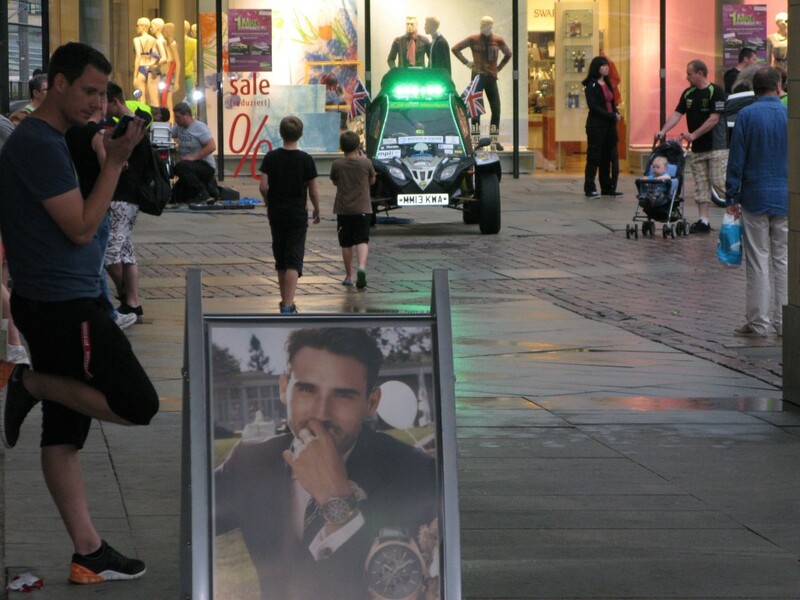 The buggy was loved by children who were excited by the ‘fun’ design and light show sponsored by the Green Light UK Company who provide innovative energy efficient and powerful LED lighting solutions for a range of domestic and industrial applications. Pedestrians were able to enjoy their stroll without noise and pollution from traffic as the buggy is powered by electricity from the sun. If we start to change over to electric vehicles, the small child will be able to grow up in a cleaner and safer environment. At Davos we were greeted by the local firemen who were very interested in our electric vehicle and showed where we could recharge. 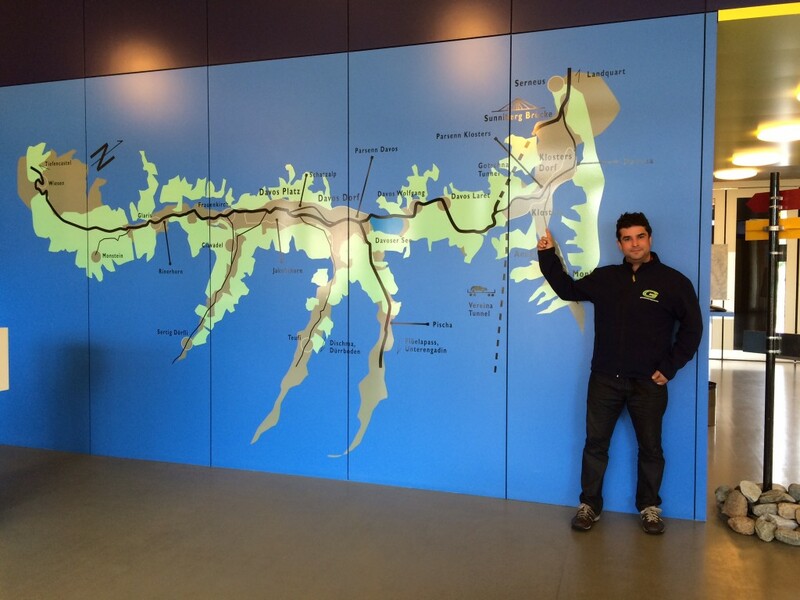 Gordon Foat of Green MotorSport is seen here demonstrating the route we were taking around Davos. Green MotorSport, vehicle 1 achieved 1976 miles and Team 11 achieved 2460 miles during WAVE 2015 powered by the Moss Solar Trust Solar Farm. The WAVE gives hope to those trying to reduce emissions of carbon dioxide, for which urban vehicles are the fastest growing source. It will be easier for people in developing countries, vast numbers of whom are projected to become more mobile in the coming decades, if we can make clean technology available and at the same time make it pleasanter to walk or cycle. Green MotorSport is currently in the process of building an electric boat on the river Thames. We are also installing a cost effective drive system in a larger family car for testing. More information about these projects will be in our next newsletter. For more information please contact Green MotorSport for details on any of our drive or battery solutions. Gordon Foat of Green MotorSport is featured in a recent book publication called The Black Hungarian which showcases real events and visited locations from WAVE. These are woven into a suspense-packed spy story that also takes current global developments into account. A major focus is on topics around electric vehicles and renewable energies.